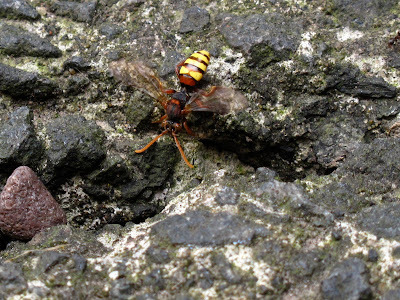 A few years ago, a crack in the concrete path at the front of our house became busy with bees coming in and out. We assumed they were honeybees that had settled their hive there, but on closer inspection they turned out to be mining bees instead. 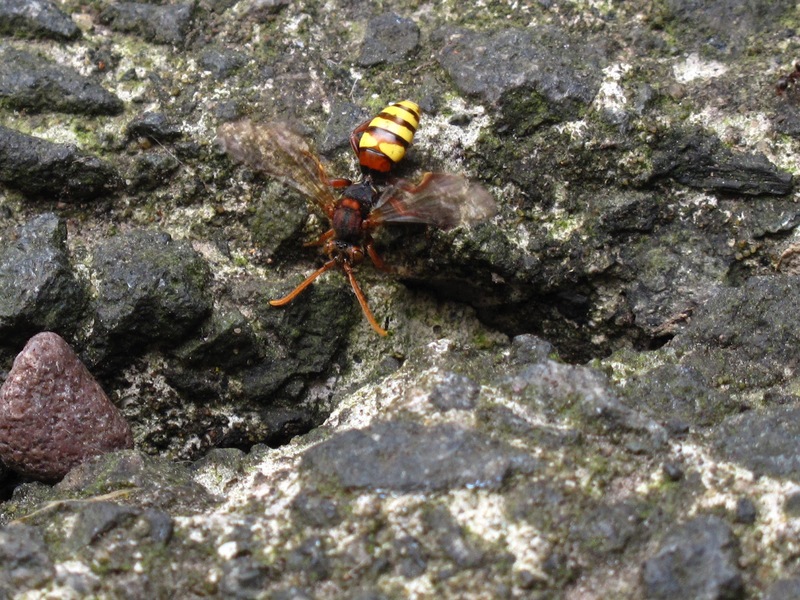 Their cleptoparasite bees, Nomada, hung around the nest entrance awaiting an opportunity to get in and lay their eggs. There are many similar species of Andrena mining bees in the UK and several of them looked very similar to mine so I finally gave up with obtaining an ID and I didn't find much more about my front path bee. 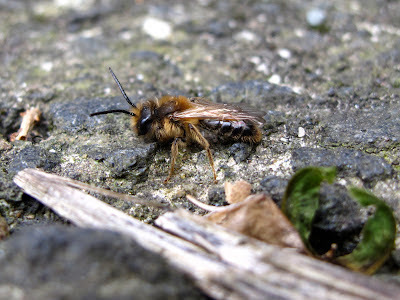 The bees are back again in the same spot, and a couple of days ago, thanks to tweep @DayMoonRoseDawn I finally knew the identity of these curious bees: they are Andrena carantonica, a large, furry mining bee. 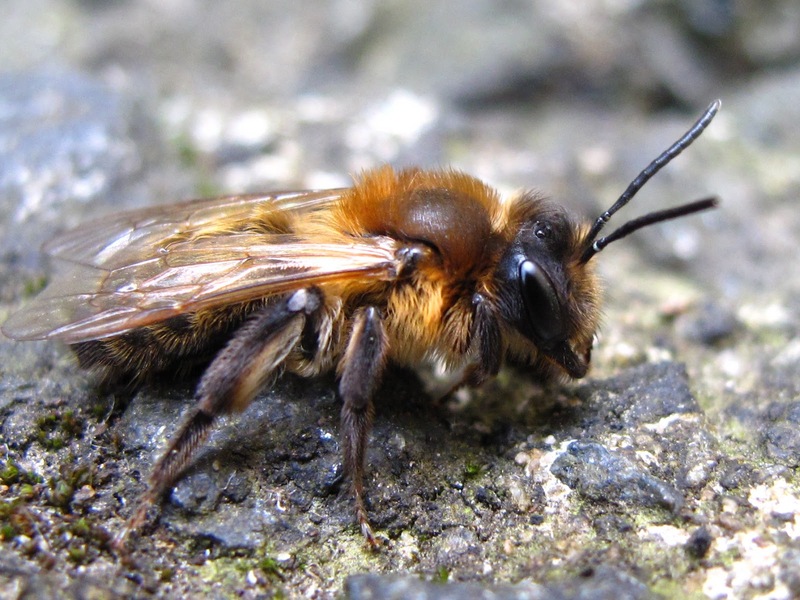 Although mining bees are solitary, a handful of species in the UK often nest communally. Communal bees have a simple form of social structure: they share a nest, but individual females will build their own cells, lay eggs and provision their own offspring: they do not have the complex social organisation with workers and division of labour of honeybees. Nesting aggregations of A. carantonica consist of hundreds of females (up to 600) females using the same nest entrance. In my street, cracks on concrete in front garden paths are favoured. Adults emerge in April, with the smaller males doing so just before females and awaiting them inside the nest. In a series of studies on this species, Robert Paxton and collaborators revealed fascinating details of the social structure of this species. In one of these studies they installed nets on nest entrances to be able to capture recently emerged bees: 75% of females were already inseminated when they left the nest for the first time, indicating that copulation happens most of the time inside the communal nests. Although the females in the nest are not highly related, there is a large amount of inbreeding in this species: genetic analysis suggests that 44% of females mate with their full brothers. Emerging females are much more numerous in a given nest (about 1 male to 3 females), although, as Rose Dawn pointed out, it is likely that many males never leave the nest and die inside after having mated, so emergence nets do not capture them. 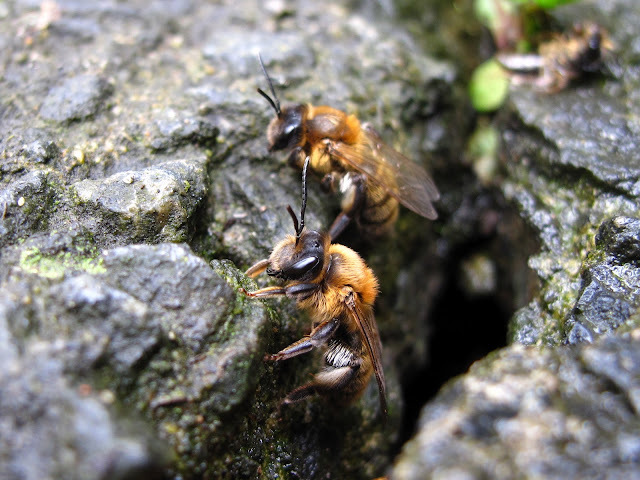 Females must by necessity swap nests after emergence so that the relatedness levels is still low within a given nest, and the bees show a high degree of tolerance to conspecifics, regardless of their nest of origin. If a high level of relatedness is not responsible for the evolution of communality, why do these bees nest communally? A potential benefit is improved nest defence. There are always bees going in or out, and in my own observations, a few bees often sit by the nest entrance (like as in the photo at the top), therefore opportunities for parasitism by cleptoparasites might be reduced. There are still many questions to answer, which probably will have to await to observations being carried out inside nests, but the study of these and other communal species might offer clues as to how and why complex social systems like those of honeybees evolved. A cleptoparasite bee Nomada flava by mining bee nest entrance. Loved this post! It made my night! Excellent. Thank you Al. I am please you liked it and thank you for commenting. Africa! this is completely facinating. I have some very similar bees inbetween the paving slabs outside the kitchen door. I wonder if they these. They are Always getting into the house and having to be rescued. I really struggle with the ID on mining bees. Also thanks so much for your comment re anhophora .. have just replied.. yes.. south facing pot! sharp green pencil, I agree, I found it so exciting to identify them and be able to research them. The key identification are the pollen baskets (white and black hairs) to be able to tell them apart from other common species. If they are under paving slabs and there are many going in and out they a bound to be this species, as the two other communal species are very rare. Excellent, I'm just home from work having found mining bees under paving slabs and didn't know what to look for to identify them. Having Just found this report I am over the moon. Thank you to all involved in collating the information.